If you’re like us, the number of days spent in the field are limited and you don’t have time to wait on Mother Nature to cooperate. The MidwayUSA Elk Fork line was designed to keep you comfortable in the stand when your quarry is active and your buddies are heading back to the truck. The Elk Fork Line features a durable and quiet brushed tricot exterior laminated to a waterproof membrane with fully taped seams and PrimaLoft Black insulation. MidwayUSA Elk Fork Bibs and Coveralls feature two cargo pockets with snap buttons, two chest pockets, and a single zippered back pocket. Knee high leg zippers help ventilate excess heat while making it easier to put them on or take them off. A brushed tricot exterior, laminated to a waterproof membrane, is both durable and quiet, featuring fully taped seams and PrimaLoft Black insulation; 200 GSM body, and 100 GSM legs. The MidwayUSA Elk Fork Bibs are available in Mossy Oak Break-Up Country, Realtree Max-1 XT and Realtree Xtra, and available in waist sizes Medium through 3XL, and inseam sizes 32” and 34”. The MidwayUSA Elk Fork Vest features a durable and quiet brushed tricot exterior laminated to a 5000/500 TPU waterproof membrane with fully taped seams and 200 GSM PrimaLoft Black insulation. When used correctly, the incorporated safety harness slit helps keep you secure and the zippered chest pockets keep your tags and phone secure. The interior mesh pockets make finding your gear simple and the waist draw cord system keeps in your body heat. The MidwayUSA Elk Fork Vest is designed to keep you warm and comfortable. The MidwayUSA Elk Fork Vest is available in Mossy Oak Break-Up Country, Realtree Max-1 XT and Realtree Xtra, and available in sizes Medium through 3XL. Mother Nature doesn’t always cooperate. For those tough sits in nasty weather, the MidwayUSA Elk Fork Parka keeps you in the field longer. 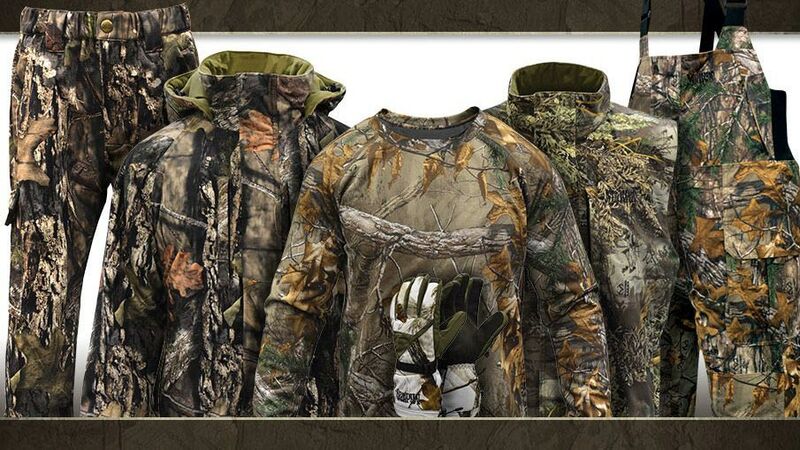 The removable and adjustable hood helps trap body heat without obstructing your vision. A slit on the back of the parka allows you to use your favorite safety harness. Keep your gear close with the two zippered hand warmer pockets, two zippered chest pockets, and two interior mesh pockets. A brushed tricot exterior, laminated to a waterproof membrane, is both durable and quiet. The fully taped seams and PrimaLoft Black insulation (200 GSM body, 100 GSM arms and hood) keeps you warm and the water and wind out. The MidwayUSA Elk Fork Vest is available in Mossy Oak Break-Up Country, Realtree Max-1 XT and Realtree Xtra, and available in sizes Medium through 3XL. Built to protect more than just your hands, MidwayUSA Elk Fork Gloves protect past your wrist to your mid-forearm. The quick cinch wrist buckle and elastic drawcord are easy to work with the opposite glove. A brushed tricot exterior, and Thinsulate insulated insert (100 GSM on palm, 140 GSM on back of glove), makes this glove durable and quiet, breathable and waterproof. MidwayUSA Elk Fork Gloves are available in Mossy Oak Break-Up Country, Realtree Max-1 XT, Realtree Xtra and Realtree AP Snow and available in sizes Medium through XL. For more information about MidwayUSA Elk Fork Hunting Clothing, visit MidwayUSA.com.